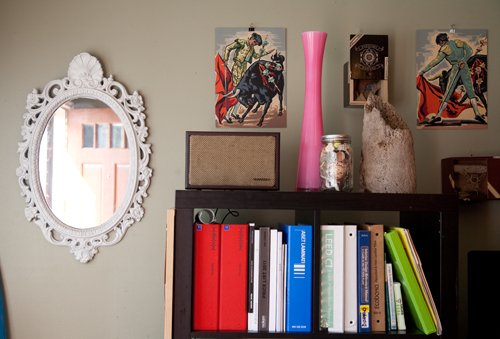 The home of Athena and Forest shows the magic that can happen when you successfully pair the design sensibilities of two fantastically creative people. 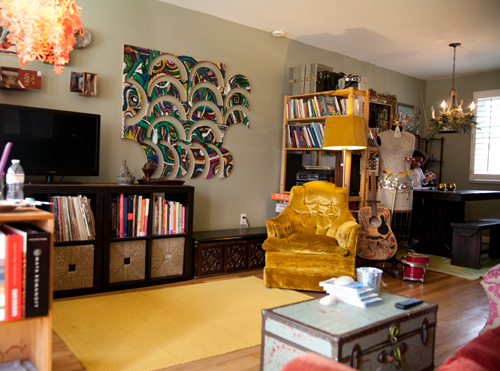 The adjectives unique, fun, stylish, and daring all come to mind when you step inside their home, but their space is all that and more. 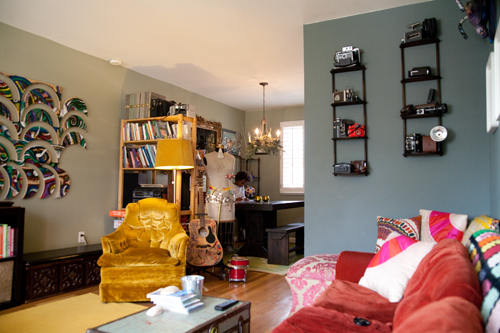 First of all, I love that they’ve taken a typical row house layout in the home they rent in Rosemont and have arranged the furniture in an atypical way. 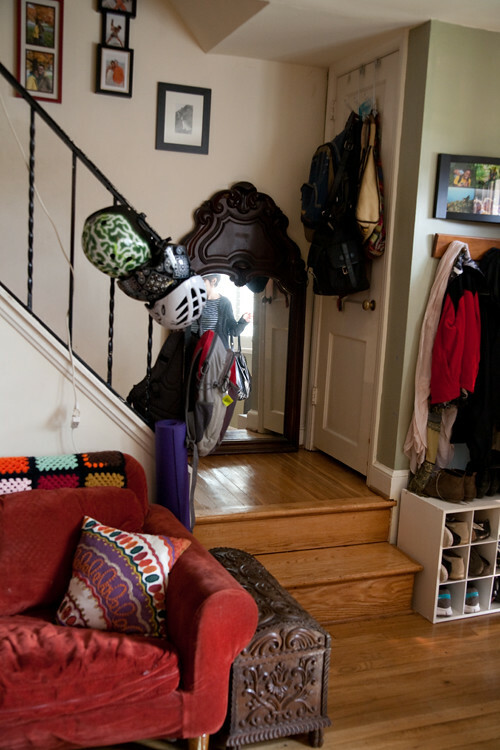 I would have never thought to put the sofa along the wall under the stair railing. 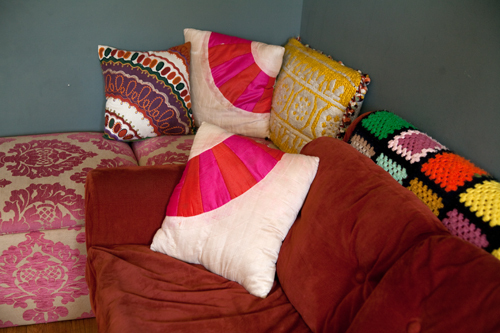 But it works really well there with the pink ottomans next to it. 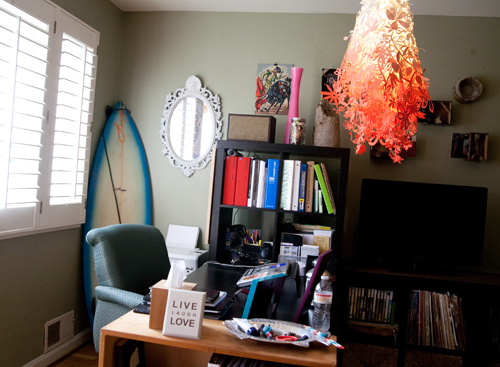 Athena, an architectural designer in her firm, Outhouse Studio, set up her home office in the front of the room, under the windows. She faces into the living room. This works great except for the tendency, she says, to get up and tidy up the room. The kind of work she does gets her out of the house often though. She recently led the remodel and interior design for Evening Star restaurant in Del Ray. I look forward to touring it with her and posting about all of her knock-out design choices. A striking pendant lamp, a paper cut by the designer Tord Boontje, divides Athena’s office from the main living room — subtle design element that complements both areas equally. 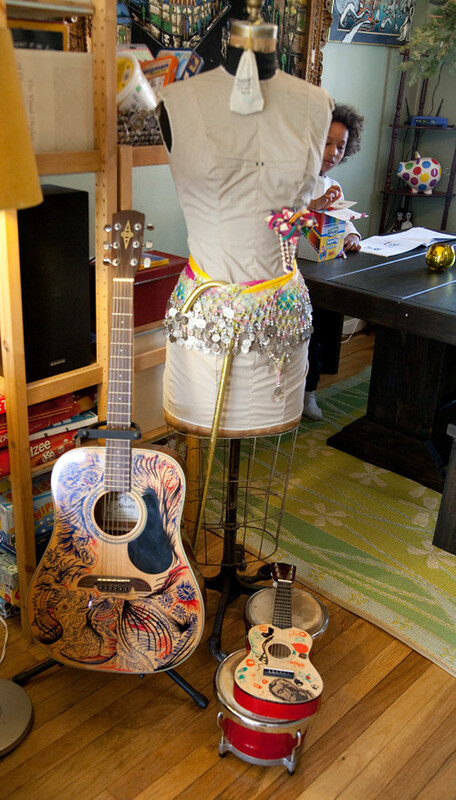 Athena and Forest have created a room divider between the living room and dining room with a set of shelves, as well guitars and a dress form. There’s an easy flow between areas that have a certain purpose, like the entrance and office areas, which flow into a living area, which flows coherently into the dining area. 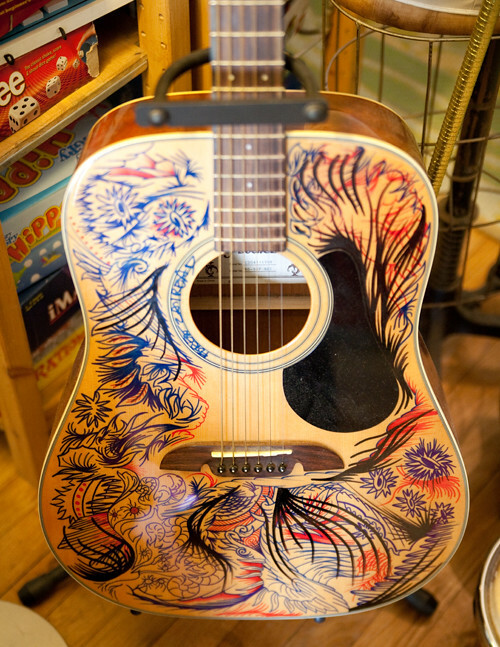 Artists one and all, Forest doodled on the larger guitar, while their 7-year-old son, Kai, doodled on his smaller version. If I were the guitarist in my family instead of my husband, I might summon the courage to alter my instrument the same way. Kai accesses art supplies on the smaller set facing the dining room. On the other side, facing into the living room, they keep games and books. 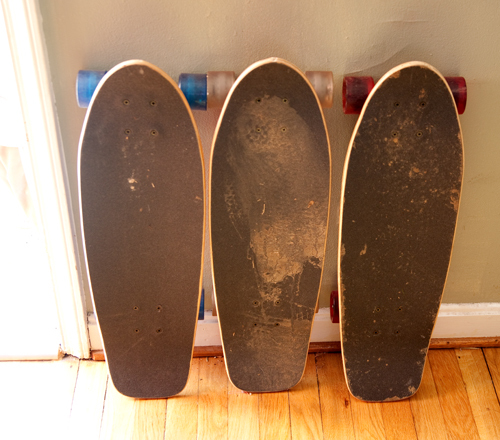 The entrance way is organized well so that shoes and coats are hung neatly behind the door and the family skateboards line the front wall. First of all, here is a family cool enough to own and ride skateboards. Second, how appealing it is to display them as a group of three. I also like how they’ve hung their three helmets on the stair railing. It helps too that each helmet has a cool graphic design. Hence, the harmonious riot of color and patterns. They also display Forest’s own art pieces throughout. Forest is a student at Corcoran earning his Fine Arts degree in Scientific Illustration and Masters in Teaching. He did his student teaching at T.C Williams high school and plans to work with the students there to create a mural for the side of the VeloCity Bike Coop on Mt. Vernon Avenue in Del Ray. A couple of years ago, he designed the mural alongside the Mt. Vernon Rec Center; he drew the outlines and during Art on the Avenue, children painted in the various sections. It was a blast for my kids! I can’t wait to see what he designs with his students for the bike coop wall. 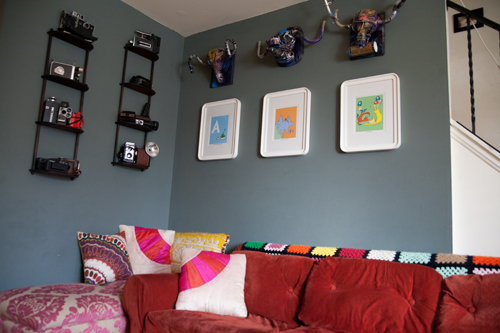 Forest constructed the three mounted heads over the sofa from bicycle parts he acquired from VeloCity Bike Coop. 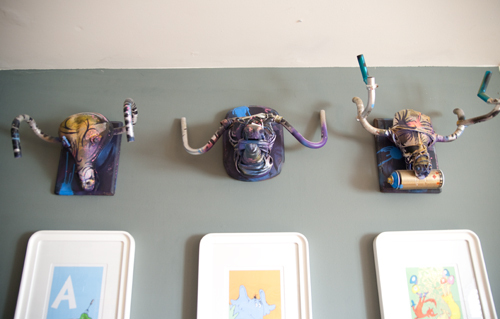 Underneath are three limited-edition Seuss prints that Forest and Athena chose together. 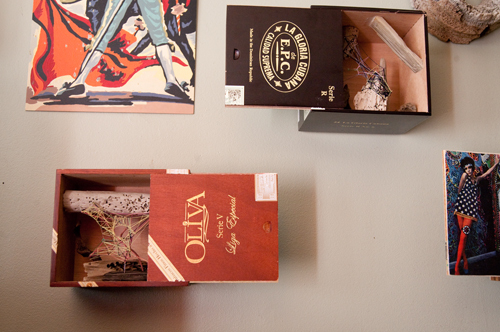 On the opposite wall, Forest has hung some of his latest creations, a set of dioramas combining drift wood, thread “webs,” and collage that he’s soon exhibiting in New York. Forest and Athena are always on the hunt for vintage finds. 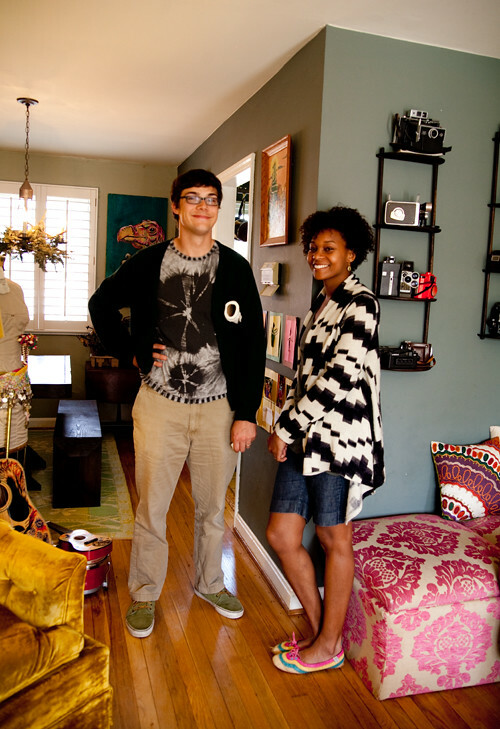 They frequent the Del Ray consignment shop, Not Too Shabby, where they scored many of their accessories and furniture. 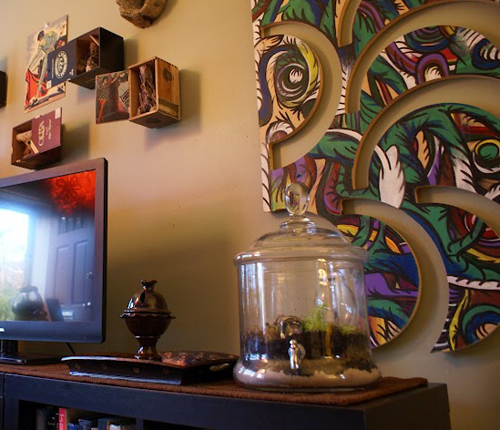 They have an affinity for kitschy art, like paint-by-numbers. 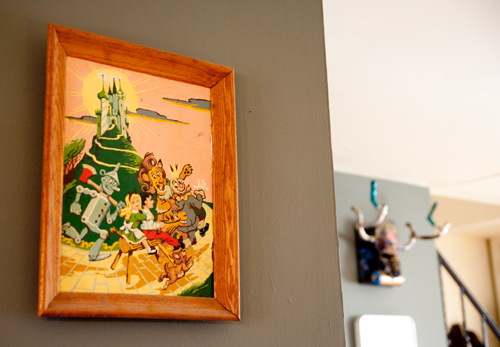 I love the humor these pieces bring to the room, including this Wizard of Oz painting, making it all seem like a playful project by a couple of talented designers who don’t take themselves too seriously. The wooden sculptural object on this shelf is a weathered piece of the trunk from a palm tree that had washed up on the beach. 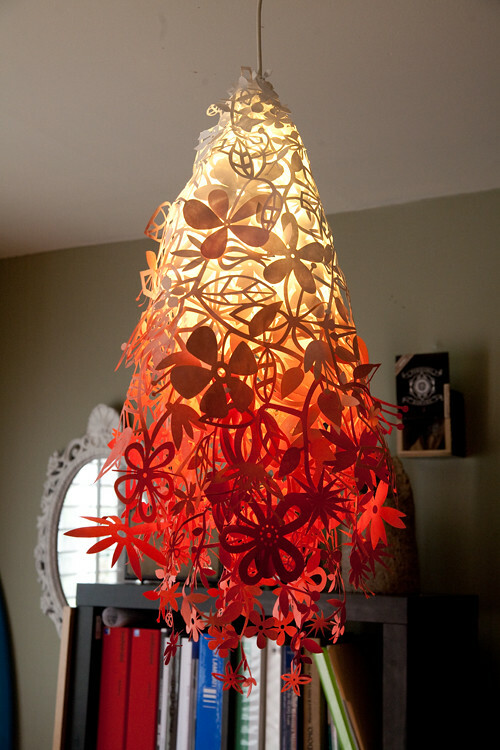 They’ve also hung one of these treasures on the wall as a three-dimensional art piece. The antique hope chest made by Lane Cedar chest holds magazines. Forest collects vintage film and video cameras. 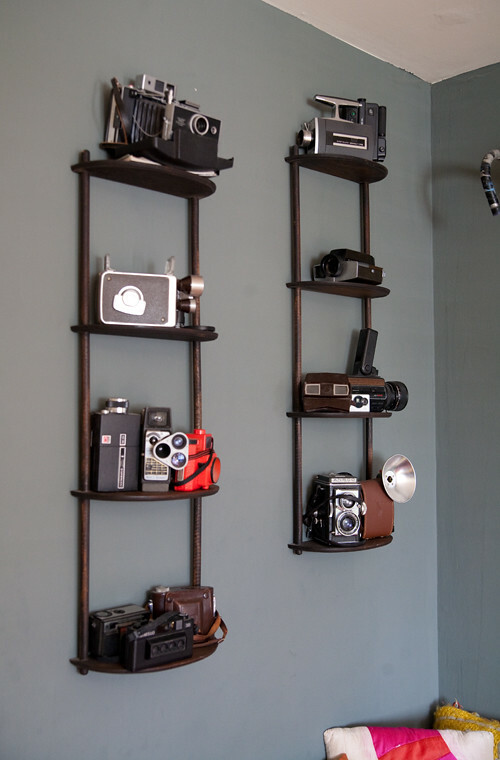 They make a gorgeous wall display perched on hanging shelves that seem custom made for the collection. 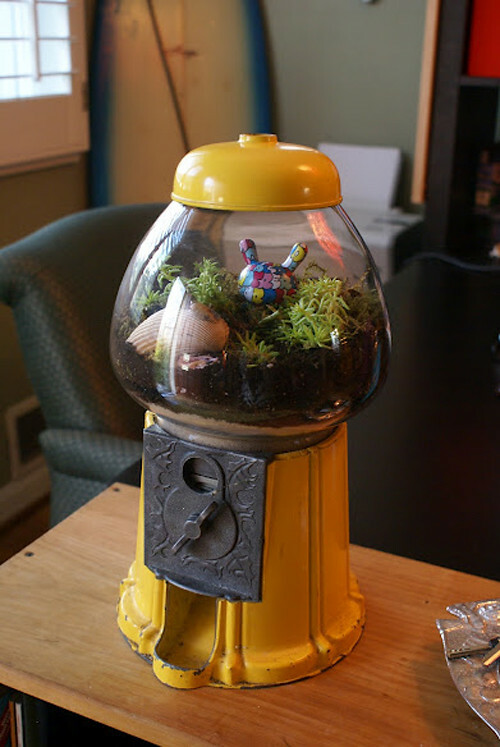 When we visited them, they were in the midst of planting terrariums together in the kitchen. Athena sent along some photos of the final pots that seem like they were made for the room and fit in perfectly. How am I not surprised!